"Hourglass Division", "Bayonet Division", "California Division"
The division was first activated in December 1917 in World War I, and based at Fort Ord, California for most of its history. Although elements of the division saw brief active service in World War I, it is best known for its participation in the Pacific Ocean theater of World War II where it took heavy casualties engaging the Imperial Japanese Army in the Aleutian Islands, Leyte, and Okinawa. Following the Japanese surrender in 1945, the division was stationed in Japan and Korea, and with the outbreak of the Korean War in 1950 was one of the first units in action. It took part in the Inchon Landings and the advance north until Chinese forces counter-attacked and almost overwhelmed the scattered division. The 7th later went on to fight in the Battle of Pork Chop Hill and the Battle of Old Baldy. After the Korean War ended, the division returned to the United States. In the late 1980s, it briefly saw action overseas in Operation Golden Pheasant in Honduras and Operation Just Cause in Panama. In the early 1990s, it provided domestic support to the civil authorities in Operation Green Sweep and during the 1992 Los Angeles Riots. The division's final role was as a training and evaluation unit for Army National Guard brigades, which it undertook until its inactivation in 2006. On 26 April 2012, the Department of Defense announced the reactivation of the 7th Infantry Division headquarters as an administrative unit. The 7th Infantry Division was activated on 6 December 1917, exactly eight months after the American entry into World War I, as the 7th Division of the Regular Army at Camp Wheeler, Georgia. One month later, it prepared to deploy to Europe as a part of the American Expeditionary Force (AEF). Most of the division sailed to Europe aboard the SS Leviathan. While on the Western Front, the 7th Division did not see action at full divisional strength, though its infantry and reconnaissance elements did engage German forces. On 11 October 1918, it first came under shell fire and later, at Saint-Mihiel, came under chemical attack. Elements of the 7th probed up toward Prény near the Moselle River, capturing positions and driving German forces out of the region. It was at this time that the division first received its shoulder sleeve insignia. In early November, the 7th Division began preparing for an assault on the Hindenburg Line as part of the Second Army. The division launched a reconnaissance in force on the Voëvre plain, but the main assault was never conducted as hostilities ended on 11 November 1918 with the signing of the Armistice with Germany. During its 33 days on the front line, the 7th Division suffered 1,709 casualties, including 204 killed in action and 1,505 wounded in action. and was awarded a campaign streamer for Lorraine. The division then served on occupation duties as it began preparations to return to the United States. The 7th Division arrived home in late 1919, served at Camp Funston, Kansas, until July 1920, and moved to Camp Meade, Maryland until 22 September 1921, when it was inactivated due to funding cuts. The 7th Division was represented in the active Regular Army from 1921 to 1939 by its even-numbered infantry brigade (the 14th) and select supporting elements. Other units of the division were placed on the Regular Army Inactive list and staffed by Organized Reserve personnel. These reserve units occasionally trained with the 14th Infantry Brigade at Fort Riley, Fort Crook, Fort Snelling, and Fort Leavenworth, and conducted the Citizens' Military Training Camps in the division's area. The division was formed on a provisional status during maneuvers in the 1920s and 1930s, and the division headquarters was activated for the August 1937 Fourth United States Army maneuvers at Camp Ripley, Minnesota, with the Minnesota Army National Guard's 92nd Infantry Brigade. On 1 July 1940, the 7th Division was formally reactivated at Camp Ord, California, under the command of Major General Joseph W. Stilwell. Most of the early troops in the division were conscripted as a part of the US Army's first peacetime military draft. The 7th Division was assigned to III Corps of the Fourth United States Army, and transferred to Longview, Washington, in August 1941 to participate in tactical maneuvers. Following this training, the division moved back to Fort Ord, California, where it was located when the Japanese attack of Pearl Harbor caused the United States to declare war. The formation proceeded almost immediately to San Jose, California, arriving 11 December 1941 to help protect the west coast and allay civilian fears of invasion. The 53rd Infantry Regiment was removed from the 7th Division and replaced with the 159th Infantry Regiment, newly deployed from the California Army National Guard. For the early parts of the war, the division participated mainly in construction and training roles. Subordinate units also practiced boat loading at the Monterey Wharf and amphibious assault techniques at the Salinas River in California. On 9 April 1942, the division was formally redesignated as the 7th Motorized Division and transferred to Camp San Luis Obispo on 24 April 1942. Three months later, divisional training commenced in the Mojave Desert in preparation for its planned deployment to the African theater. It was again designated the 7th Infantry Division on 1 January 1943, when the motorized equipment was removed from the unit and it became a light infantry division once more, as the Army eliminated the motorized division concept fearing it would be logistically difficult and that the troops were no longer needed in North Africa. The 7th Infantry Division began rigorous amphibious assault training under US Marines from the Fleet Marine Force, before being deployed to fight in the Pacific theater instead of Africa. 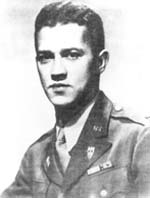 USMC General Holland Smith oversaw the unit's training. Elements of the 7th Infantry Division first saw combat in the amphibious assault on Attu Island, the western-most Japanese entrenchment in the Aleutian islands chain. Elements landed on 11 May 1943, spearheaded by the 17th Infantry Regiment. The initial landings were unopposed, but Japanese forces mounted a counteroffensive the next day, and the 7th Infantry Division fought an intense battle over the tundra against strong Japanese resistance. The division was hampered by its inexperience and poor weather and terrain conditions, but was eventually able to coordinate an effective attack. The fight for the island culminated in a battle at Chichagof Harbor, when the division destroyed all Japanese resistance on the island on 29 May, after a suicidal Japanese bayonet charge. During its first fight of the war, 600 soldiers of the division were killed, while killing 2,351 Japanese and taking 28 prisoners. After American forces secured the island chain, the 159th Infantry Regiment was ordered to stay on the island, and the 184th Infantry Regiment took its place as the 7th Division's third infantry regiment. The 184th Infantry remained with the division until the end of the war. The 159th Infantry Regiment stayed on the island for some time longer until returning to the mainland United States, where it remained until the end of the war. The 7th Infantry Division left Hawaii on 11 October, heading for Leyte and include the Filipino troops of the Philippine Commonwealth Army and Philippine Constabulary were aided against the Japanese. [clarification needed] At this time it was under the command of XXIV Corps of the Sixth United States Army. On 20 October 1944, the division made an assault landing at Dulag, Leyte, initially only encountering light resistance. Following a defeat at sea on 26 October, the Japanese launched a large, uncoordinated counteroffensive on the Sixth Army. After heavy fighting, the 184th Infantry secured airstrips at Dulag, while the 17th Infantry secured San Pablo, and the 32nd Infantry took Buri. 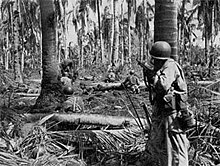 The 17th Infantry troops moved north to take Dagami on 29 October, in intense jungle warfare that produced high casualties. The division then shifted to the west coast of Leyte on 25 November and attacked north toward Ormoc, securing Valencia on 25 December. An amphibious landing by the 77th Infantry Division effected the capture of Ormoc on 31 December 1944. The 7th Infantry Division joined in the occupation of the city, and engaged the 26th Japanese Infantry Division, which had been holding up the advance of the 11th Airborne Division. The 7th Division's attack was successful in allowing the 11th Airborne Division to move through, however, Japanese forces proved difficult to drive out of the area. 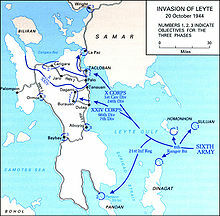 As such, operations to secure Leyte continued until early February 1945. 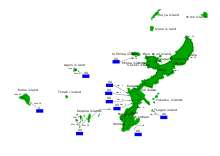 Afterward, the division began training for an invasion of the Ryukyu island chain throughout March 1945. It was relieved from the Sixth Army and the Philippine Commonwealth military, which went on to attack Luzon. At the outbreak of the Korean War in June 1950, the 7th Infantry Division commander, Major General David G. Barr, assembled the division at Camp Fuji near Mount Fuji. The division was already depleted due to post-war shortages of men and equipment and further depleted as it sent large numbers of reinforcements to strengthen the 25th Infantry Division and 1st Cavalry Division, which were sent into combat in South Korea in July. The division was reduced to 9,000 men, half of its wartime strength. To replenish the ranks of the understrength division, the Republic of Korea Army (ROK) assigned over 8,600 Korean soldiers to the division. The Colombian Battalion was at times attached to the division. With the addition of priority reinforcements from the US, the division strengthwas eventually increased to 25,000 when it entered combat. Also fighting with the 7th Infantry Division for much of the war were members of the three successive Kagnew Battalions sent by Emperor Haile Selassie I of Ethiopia as part of the UN forces. The division paired with the 1st Marine Division under US X Corps to participate in the Inchon Landing, code named Operation Chromite. The two divisions would be supported by the US 3rd Infantry Division in reserve. Supported by 230 ships of the US Navy, X Corps began landing at Inchon on 15 September 1950, catching the Korean People's Army (KPA) by surprise. The 7th Infantry Division began landing on 18 September, after the 1st Marine Division, securing its right flank. X Corps quickly advanced to Seoul and the 1st Marine Division attacked the 20,000 defenders of the city from the north and southwest, while the 7th Infantry Division's 32nd Infantry Regiment attacked from the southeast. The 31st Infantry followed behind. Seoul fell to X Corps after suffering moderate casualties, particularly for the Marines. The division then began advancing south to cut off KPA supply routes. The 32nd Infantry crossed the Han River on 25 September to create a bridgehead, and the next day, the division advanced to Osan 30 miles (48 km) south of Seoul and linked up with the 1st Cavalry Division of Eighth United States Army which had broken out from the Pusan perimeter starting on 16 September and then began a general offensive northward against crumbling KPA opposition. Radio miscommunication and attack from nearby KPA forces caused a miscommunication, the soldiers of the 1st Cavalry and 7th Infantry briefly engaged in a small-arms firefight with one another, unable to communicate. Seoul was liberated one day later with the help of air assets from the 1st Cavalry Division. The combined forces of the Eighth Army cut off and captured retreating KPA forces. X Corps was kept separate from the rest of the Eighth Army to avoid placing a burden on the logistical system. As part of the UN offensive into North Korea 7th Division withdrew to Pusan to conduct another amphibious assault on the east coast of North Korea. The entire battle for Inchon and Seoul cost the division 106 killed, 411 wounded and 57 missing American soldiers, and 43 killed, 102 wounded South Korean soldiers. The Chinese People's Volunteer Army (PVA) entered the war on the side of North Korea, making their first attacks in late October. 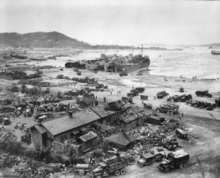 The 7th Infantry Division began landing at Wonsan on 26 October, and Iwon on 29 October. The landing was delayed due to the presence of mines, and by the time X Corps came ashore, ROK forces moving overland had already occupied the ports. The division advanced to Hyesanjin, on the China–North Korea border by the Yalu River, one of the northernmost advances for UN soldiers of the war. Much of X Corps followed behind. On 21 November, the 17th Infantry reached the banks of the Yalu River. The advance went quickly for the 7th Infantry Division and ROK troops while the Marines were not able to advance as quickly. The division halted its advance until 24 November while other units of the Eighth Army's IX Corps and ROK II Corps caught up and supply lines were established. During this time, the 7th Division's regiments were spread out on the front line. The 31st Infantry Regiment remained at the Chosin Reservoir with the 1st Marine Division while the 32nd and 17th Infantry Regiments were much further to the northeast, closer to ROK I Corps. It was during this time that the division was served by a new type of unit, the 1st Mobile Army Surgical Hospital (M.A.S.H.). The UN forces renewed their offensive on 24 November before being stopped by the PVA Second Phase Offensive starting on 25 November with attacks on Eighth Army's IX Corps and ROK II Corps in the west and X Corps in the east. X Corps found itself under attack from the PVA 20th, 26th and 27th Field Armies, commanding a total of 12 divisions. During the furious action that followed, the 7th Infantry Division's spread out regiments were unable to resist the overwhelming PVA forces. Three of the division's infantry battalions were attacked from all sides the next day. 1st Battalion, 32nd Infantry (nicknamed Task Force Faith) was trapped with two other battalions by the PVA 80th and 81st Divisions from the 27th Field Army. 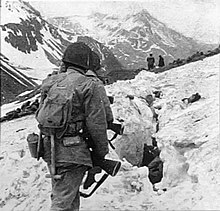 In the subsequent Battle of Chosin Reservoir, the three battalions were destroyed by overwhelming PVA forces suffering over 2,000 casualties. The 31st Infantry suffered heavy casualties trying to fight back the PVA forces further north, but the 17th Infantry was spared of heavy attack, retreating along the Korean coastline, out of range of the offensive. By the time X Corps ordered a retreat, most of the 7th Infantry Division, save the 17th Infantry Regiment, had suffered 40 percent casualties. The scattered elements of the division saw repeated attacks as they attempted to withdrawal to the port of Hungnam in December 1950. These attacks cost the division another 100 killed before it was evacuated on 21 December. The division suffered 2,657 killed and 354 wounded during the retreat. Most of the dead were members of Task Force Faith. The division returned to the front lines in early 1951, spearheaded by the 17th Infantry, which had suffered the fewest casualties from the PVA offensive. Division elements advanced through Tangyang in South Korea, and blocking PVA offensives from the northwest. The division reached full strength and saw action around Cheehon, Chungju, and Pyeongchang as part of an effort to push the KPA and PVA forces back above the 38th Parallel and away from Seoul. 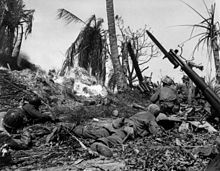 The 7th Infantry Division engaged in a series of successful "limited objective" attacks in the early weeks of February, a series of small unit attacks and ambushes between the two sides. It would continue slowly advancing and clearing enemy hilltop positions through April. By April the entire Eighth Army was advancing north as one line stretching across the peninsula, reaching the 38th Parallel by May. The division, now assigned to IX Corps, then assaulted and fought a fierce three-day battle culminating with the recapture of the terrain that had been lost near the Hwachon Reservoir just over the 38th Parallel in North Korea. In capturing the town bordering on the reservoir it cut off thousands of PVA/KPA troops. The division fought on the front lines until June 1951 when it was assigned to the reserve for a brief rest and refitting. When the division returned to the lines in October, after another assignment in reserve, it moved to the Heartbreak Ridge sector recently vacated by the 2nd Infantry Division, where it was supported by the 3rd Infantry Division and 1st Cavalry Division. During this new deployment the division fought in the Battle for Heartbreak Ridge, to take an area of staging grounds for the PVA/KPA armies. It remained static in the region until 23 February 1952 when it was sent into reserve and relieved by the 25th Infantry Division. The next year saw the 7th Division engaged in an extended campaign for nearby land, the Battle of Old Baldy. The 7th Division continued to defend "Line Missouri" through September 1952, though it became known as the "Static Line" as UN forces made few meaningful gains in the time. The division continued patrol activity around Old Baldy and Pork Chop Hill into 1953, digging tunnels and building a network of outposts and bunkers on and around the hill. In April, the KPA began stepping up offensive operations against UN forces. During the Battle of Porkchop Hill, the PVA 67th and 141st Divisions overran Pork Chop Hill using massed infantry and artillery fire. The hill had been under the control of the 31st Infantry. The 31st counterattacked with reinforcements from the 17th Infantry and recaptured the area the next day. On 6 July the PVA/KPA launched a determined attack against Pork Chop resulting in five days of fierce fighting with few meaningful results. By the end of July, five infantry battalions from the 31st and 17th were defending the hill, while a PVA division was in position to attack it. During this standoff, the UN ordered the 7th Infantry Division to retreat from the hill in preparation for an armistice, which would end major hostilities. 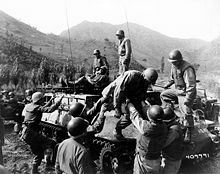 From 1953 to 1971, the 7th Infantry Division defended the Korean Demilitarized Zone. Its main garrison was Camp Casey, South Korea. On 1 July 1963, the division was reorganized as a Reorganization Objective Army Division (ROAD). Three Brigade Headquarters were activated and Infantry units were reorganized into battalions. The division's former headquarters company grew into the 1st Brigade, 7th Infantry Division while the 13th Infantry Brigade was reactivated as the 2nd Brigade, 7th Infantry Division. The 14th Infantry Brigade was reactivated as the 3rd Brigade, 7th Infantry Division In 1965 the division received its distinctive unit insignia, which alluded to its history during the Korean War. In 1989 the 7th Infantry Division participated in Operation Just Cause in Panama, briefly occupying the country in conjunction with the 82nd Airborne Division. Elements of the 7th Infantry Division landed in the northern areas of Colón Province, Panama, securing the Coco Solo Naval Station, Fort Espinar, France Field, and Colón while the 82nd Airborne and US Marines fought in the more heavily populated southern region. 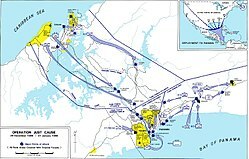 Once Panama City was under US control, the 82nd quickly re-deployed and left the city under the control of the 7th Division's 9th Infantry Regiment until after the capture of Manuel Noriega. It suffered four killed and three wounded in the operation. In 1993 the division was slated to be inactivated as part of the post-Cold War drawdown of the US Army. The 1st Brigade relocated to Fort Lewis in 1993 and was reflagged on 15 August 1995 as the 1st Brigade, 25th Infantry Division; while the 2nd Brigade and the 3rd Brigade of the 7th was inactivated at Fort Ord. The division headquarters was formally inactivated on 16 June 1994 at Fort Lewis. Though it was inactivated, the division was identified as the highest priority inactive division in the United States Army Center of Military History's scheme based on age, campaign participation credit, and unit decorations. All of the division's flags and heraldic items were moved to the National Infantry Museum at Fort Benning, Georgia following its inactivation. At the time it was determined that, should the US Army decide to activate more divisions in the future, the center would most likely suggest the first new division be the 7th Infantry Division, the second be the 9th Infantry Division, the third be the 24th Infantry Division, the fourth be the 5th Infantry Division, and the fifth be the 2nd Armored Division. ^ "7th Infantry Division". US Army. Retrieved 12 October 2017. ^ a b c d e f g h i j k l m n "7th Infantry Division Homepage: History". 7th Infantry Division. 2003. Archived from the original on 19 April 2009. Retrieved 27 April 2009. ^ a b "The Institute of Heraldry: 7th Infantry Division". The Institute of Heraldry. 2012. Archived from the original on 2 October 2012. Retrieved 9 June 2012. ^ Clay, Steven E. (2010). U.S. Army Order of Battle 1919-1941. Combat Studies Institute Press. ^ "7th Infantry Division Homepage: Chronological History". 7th Infantry Division. 2003. Archived from the original on 16 April 2009. Retrieved 27 April 2009. ^ "Medal of Honor Recipients — Korean War". United States Army. Archived from the original on 13 April 2008. Retrieved 24 April 2008. ^ a b c d "GlobalSecurity.org: 7th Infantry Division". GlobalSecurity. 2003. Archived from the original on 17 April 2009. Retrieved 27 April 2009. ^ a b "Lineage and Honors Information: 7th Infantry Division". United States Army Center of Military History. 2009. Archived from the original on 28 April 2009. Retrieved 27 April 2009. ^ a b "First Army Organization". First United States Army Public Affairs. Archived from the original on 14 June 2008. Retrieved 20 November 2009. ^ a b Petrich, Marisa (26 April 2012). "SecArmy announces new division headquarters coming to Lewis-McChord". Joint Base Lewis-McChord, Washington: JBLM Public Affairs Office. Retrieved 29 April 2012. ^ Misterek, Matt (11 May 2012). "General who will lead new HQ at JBLM has public-affairs practice". Tacoma, Washington: The News Tribune. Archived from the original on 16 June 2012. Retrieved 9 June 2012. ^ Kibler, Lindsey (12 October 2012). "7th ID eyes Pacific, reactivates as Army's 'Stryker Division'". Joint Base Lewis–McChord: U.S. Army Public Affairs. Retrieved 27 April 2018. This page was last edited on 17 April 2019, at 23:12 (UTC).